Pippa Norris explains how generation gaps divide the British electorate and mainstream parties. She writes that while the EU referendum was a prime example of how these divisions play out in the UK, the changing nature of electoral cleavages raises important questions about politics and party competition in western democracies more generally. On the ‘demand side’ of the equation, once the referendum was triggered, several factors help to explain the main drivers of public opinion and voting behavior determining the outcome of the 2016 referendum – as well as the ups and downs of UKIP’s electoral support during the 2015 and 2017 general elections. Work by Harold D. Clarke et al. argues that Euroscepticism was fueled by anxieties about government management of immigration and, to a lesser extent, the economy and NHS. But a broader comparative perspective suggests that Brexit is part of the phenomenon of authoritarian-populism which has been sweeping across the globe, so it needs a more general explanation than one based on British party politics alone. Meanwhile, the Interwar generation supported Leave, and UKIP, because they tend to endorse a broader range of socially-conservative and authoritarian values associated with nationalism, Euroscepticism, and immigration. The generation gap in Europe and America is linked with cultural cleavages around these issues. As the old Left-Right divisions of social class identities have faded in Britain, an emerging cultural war deeply divides voters and parties around values of national sovereignty versus cooperation among EU member states; respect for traditional families and marriage versus support for gender equality and feminism, tolerance of diverse lifestyles and gender fluid identities; the importance of protecting manufacturing jobs versus environmental protection and climate change; and restrictions on immigration and closed borders versus openness towards refugees, migrants, and foreigners.In the long-term, the silent revolution continues to move the Western societies gradually in a more liberal direction. In the short-term, however, older generations are far more likely to vote than the young – and the authoritarian reaction against progressive values has mobilized to become significant force in politics. After controlling for the standard socio-economic and demographic variables, the results show that support for both Authoritarian and Populist values strongly predicted Leave voting. 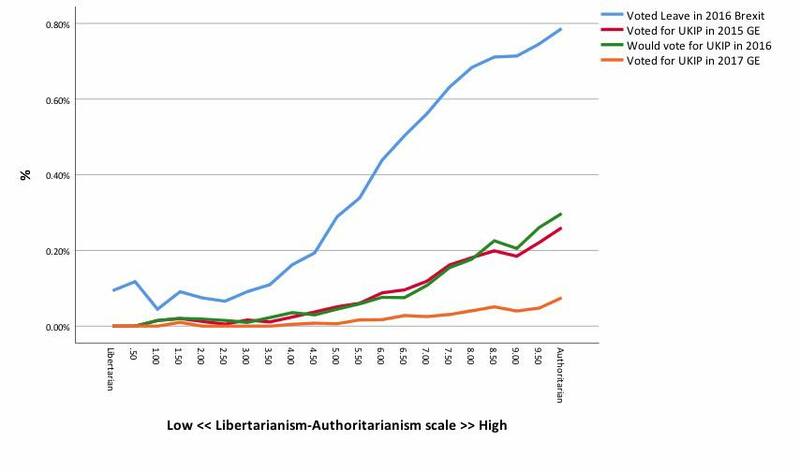 As Figure 2 illustrates, authoritarian-libertarian values strongly predict the Leave vote in Brexit and support for UKIP. 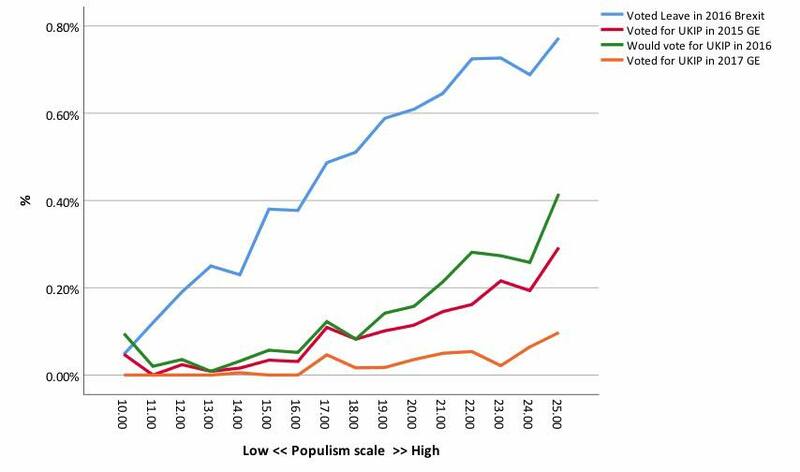 Similarly disparities can be observed among those scoring highest in the populism scale. Moreover these patterns predict not only who voted Leave in the EU referendum, but also support for UKIP in the 2015 and 2017 general elections. The data confirms that authoritarian and populist values were strongly linked with generational gaps and with voting behavior in Brexit, as expected. 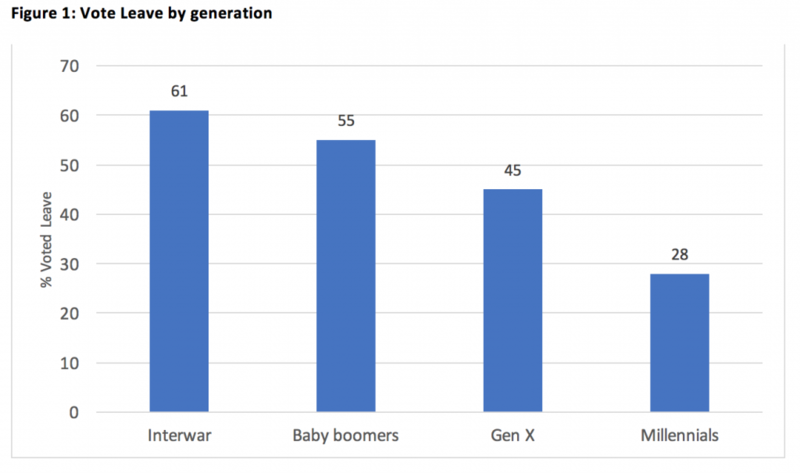 Therefore, the evidence suggests that generation gaps revolving around cultural issues deeply divide the electorate and factions within mainstream parties as well. The Leave vote mobilized the older generation by appealing to nationalistic and nativist identities, achieving a bare majority favoring divorce from the EU, while Gen X and the Millennials were more pro-EU – but also far less likely to get to the polls. If a second referendum were to be held today, the generation gap in turnout is likely to prove critical for the outcome. This development raises important challenges about the changing nature of electoral cleavages and party competition in Britain and elsewhere.